NOTE: Most titles shipped via USPS Media Mail. Allow 3-4 weeks for delivery. AFDCS Exclusive! First issued in 1975, this newly expanded 2018 edition is the ultimate resource for the 1969 Moon Landing stamp (Scott C76). This new version, now over 500 pages, features 1,372 covers and ephemera - 166 more items than the last version of the catalog. Most cachet images are in color, and the listings feature cachets, postcards, ephemera material, combination covers, known stuffers, and a selection of foreign destination covers. 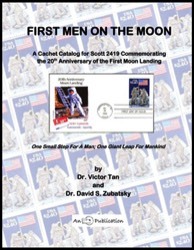 In addition, Chris Calle, son of Paul Calle, the C76 designer, has contributed the section, “Paul Calle: Putting His Stamp on the Moon.” With the 50th anniversary of mankind's greatest achievement soon upon us, this new version of the catalog is a must for collectors of this issue, and any collector of FDCs from this era. Available as a PDF download or as unbound printed pages delivered by mail. AFDCS Exclusive! The Albert Einstein Prominent Americans 8-cent stamp was issued March 14, 1966, the 87th anniversary of Einstein's birth. In this monograph collector Al Raddi presents his diverse collection of first day covers for the stamp, ranging from covers by the major producers of the day to unique add-ons done by celebrated comic book artists nearly five decades later. The eclectic collection is a treat for both traditionalists and aficionados of modern caricature. 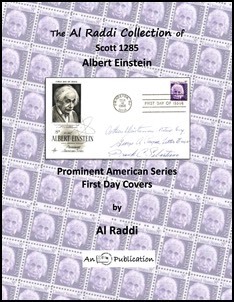 The book features a thumbnail biography of Einstein, background information on the stamp, and a look at other Einstein stamps from around the world. Available as a PDF download or as unbound printed pages delivered by mail. AFDCS Exclusive! A comprehensive review of first day covers for the $2.40 Moon Landing 20th anniversary stamp (Scott 2419) issued in 1989. At 220 pages and containing hundreds of color illustrations, this landmark work is the result of 25 years of collecting, research and study. 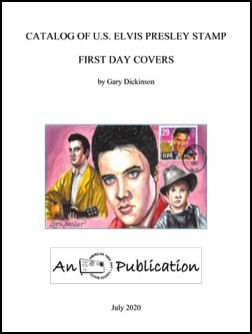 Among the many topics covered are plate numbers found on first day covers, official and unofficial cancellations, printing errors and freaks found on first day covers, and, of course, cachet illustrations from A(dam) to Z(idek). Any collector of this issue will certainly want this catalog, as well as any student of late 1980s cachets and cachetmakers. Available as a PDF download or as unbound printed pages delivered by mail. 250 pages, softbound, with supplement. 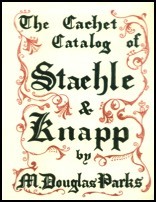 Well illustrated work of classic cachets designed by Ludwig Staehle and Dorothy Knapp, with pricing guide. 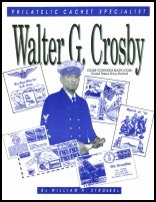 Crosby was perhaps the most prolific cachet maker, his work spans from 1930 to 1946. 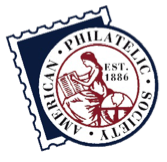 The usual new stamps and historic events, much relates to the Navy; Old Ironsides, Tonga Tin Can Mail, Atomic Bomb Tests in the Marshall Islands, etc. A fun book! 1995, 150 pages, card covers. 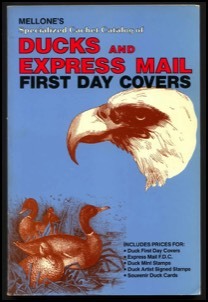 This catalog identifies, pictures and prices all known cacheted Duck and Express Mail First Day Covers. 6 x 9" format. Illustrations plus cachetmaker, color, quantity and pricing information are given. Each listing is assigned a unique cachet number. The duck hunting issues covered are for RW43, RW46 through RW54. Also listed are estimated prices for the Federal Duck Stamps, including Artist Signed Singles; the Golden Anniversary Special Commemorative issue; and Souvenir Duck Cards. The Express Mail issues are for the $9.35 Express Mail issue of 1983 (Sc. #1909) and the $10.75 Express Mail issue of 1985 (Sc. #2122). 140 pages. Published in 1988. 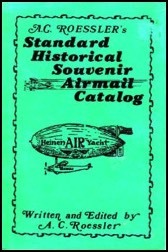 In 1932, Roessler wrote, edited, published, and marketed the A.C. Roessler Historical Souvenir AirMail Catalog. This soft covered catalog contains many listings for Air, Ship, and Zeppelin covers from the 1919 Trans-Atlantic cover to the 1932 Amelia Earhart record cover. You will also find photos and many insights on Lindy, Mears, Echener and more. We have reprinted this valuable catalog on heavy glossy 60 lb. paper stock. The catalog contains 50 pages, and has 100 photos and illustrations with many Roessler comments about his cachets and covers.